You can instantly create a casino scene in your room that is perfect for casino night parties. 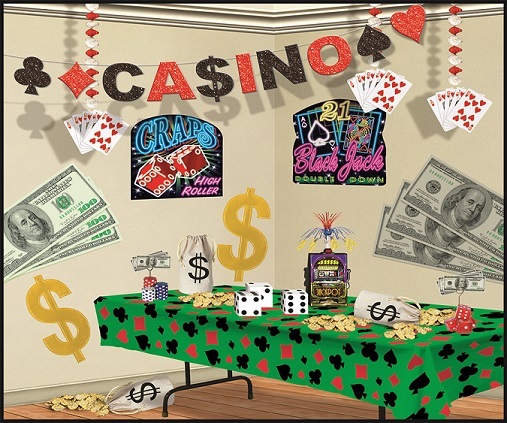 Simply hang the casino night backdrop then add any of the casino props to customize your casino theme look. Make your guest feel like a bunch of High-Rollers when they walk into a room that looks like a real casino. Mix and match any of these casino props to the casino background and you can instantly transform your plain room into a casino scene. The Insta-Theme backdrops are 30 feet wide and can be cut to fit your room, hallway, or banquet hall. Hang some of our big bucks cutouts on the walls and decorate your tables with our Slot Machine Centerpieces. Casino night parties are quickly becoming one of the most popular adult theme parties around! Struggling to think of some great casino night party ideas? Browse this page and in seconds you'll be back on track and ready to go! Cover the walls in these neon casino cutouts to replicate the strip in Las Vegas! Use our casino plastic table cover to not only make your tables look great but to also make cleanup a breeze at the end of the night! You could even string our glittered casino streamer across the room to add a classy feel to your home or event space. It is our goal to provide our loyal customers with the best possible products for the lowest possible prices. No matter what kind of casino night party decorations you're looking for we've got you covered! We're PartyCheap.com and we know how to party!